Daisaku Ikeda was born in Japan. 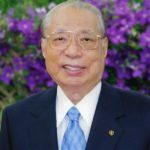 He is the founder and current president of Soka Gakkai International (SGI). It is an international offshoot of Soka Gakkai, a Nichiren Buddhist association which has more than 12 million members. In 1996, he was referred to as “puzzle of conflicting perceptions”. Some even named him the most powerful man in Japan, while others openly said that he represents a threat to democracy. However, most of his followers regard him as an inspired teacher and a man of deep learning. Ikeda and Soka Gakkai have been the frequent targets of criticism for fostering a cult of personality centered around Ikeda. "I firmly believe that the mission of religion in the 21st century must be to contribute concretely to the peaceful coexistence of humankind." "A great revolution in just one single individual will help achieve a change in the destiny of a society and, further, will enable a change in the destiny of humankind." "No one can live entirely on their own, nor can any country or society exist in isolation." "It is only through such real-life daily struggles and challenges that a genuine sensitivity to human rights can be inculcated. This is a truth that is not limited to school education: it applies to all of us." "In the past, human society provided encouragement and opportunity for people to extend support to each other, especially in highly stressful situations."